Today, Friday, February 5th, downtown San Diego will witness a “Dump Dumanis” and Justice for Fridoon Nehad rally in front of the Hall of Justice on Broadway. Dumanis, of course, is the District Attorney of San Diego County and Fridoon Nehad was the unarmed Afghan immigrant gunned down by a San Diego police officer in the Midway District last April. From 4 to 5:30 pm, the coalition that has coalesced around Fridoon’s death along activists from several local organizations will rally and hold a press conference at the San Diego Hall of Justice to charge DA Dumanis with 22 counts of abuse of power. The Hall of Justice is located at 330 W. Broadway. The Coalition accuses DA Bonnie Dumanis of abusing her power, withholding evidence, misleading the media, persecuting innocents under the guise of a “gang injunction” and having failed her public responsibilities related to the unjustified killing of Fridoon Nehad. Local speakers will be joined by Jamala Rogers of Ferguson/St. Louis MO, where the people’s movement successfully ousted the Police Chief, the City Judge and the City Manager after the killing of Michael Brown. On April 30th, 2015, seconds after arriving on the scene, SDPD Officer Neal Browder shot and killed Fridoon Nehad, an Afghan refugee suffering PTSD from his imprisonment by the Taliban. After the killing, Dumanis allowed Officer Neal Browder to be coached and to revise his statement about the shooting, changing his story on 4/30/15 from “Fridoon Nehad was not armed” to “Fridoon Nehad seemed to be armed with a knife” and that he was “agressing at (sic) my car,” on 5/5/15. While security video footage that Dumanis saw herself and kept secret from the public for almost 8 months, shows no knife, the falsified testimony is what Dumanis referred to on 11/9/2015 as part of her “exhaustive investigation” that led to her decision not to press charges against officer Browder. This decision has put a killer cop back on the streets. Sadly, Fridoon Nehad is not the only victim of Dumanis’ corruption. Dumanis has failed to fairly investigate the shooting of LaMontez Jones, Victor Ortega, and dozens of other unarmed African, Mexican, and other people who have died at the hands of police violence. While allowing law enforcement officers to play judge, jury, and executioner with impunity, she prosecuted and attempted to lock up African and Mexican youth for life using 182.5 “gang injunctions,” arguing that their knowledge of and proximity to criminal activity, was justification for life sentences. and there is Justice for Fridoon and the other unarmed victims of police shootings. 22. 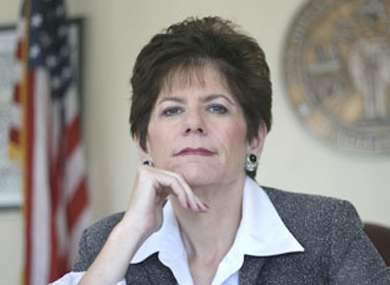 Whereas under the Federal “Color of Law” statute, DA Bonnie Dumanis has abused the power and privileges of her office. Therefore be it further resolved that the ineffective and spineless Citizens Review Board, that has no subpoena power and no history of truth telling, be replaced with a Citizens Review Board with an all-new Community Review Board be put on the ballot for a vote of the people of San Diego so that a new independent police review institution can be born. There is Justice for Fridoon and the other unarmed victims of police shootings. In 2012, I was the administrator of a church in La Mesa. I was on my way to meet with another lady for discipleship and was rear ended by an undercover San Diego police officer. The city doesn’t carry insurance! My car was totaled and I was hurt so I had to take them to court to get the expenses paid. Ms. Dumanis allowed the officer to lie and say he was only going 5 miles an hour even though the whole rear end of my car was smashed to the point that the back doors would not open and the frame was bent. I had to have someone climb in through the front seat to the trunk to get my belongings out. The city attorney tried to make me look like a hypochondriac and even tried to catch me doing something to prove I wasn’t hurt by having someone film me covertly. I was examined by a number of doctors, including one that the city hired, who all said the same thing. I was permanently injured by the accident and would need further care and not be able to work. These findings were in the depositions of all the doctors and were confirmed by all the verbal testimony with the exception of the city’s doctor. He got up on the stand and lied. He completely reversed his opinion and when confronted that he was perjuring himself, he just smiled. They had paid him over $10,000 to lie. I lost the case and only got $20,000 after expenses which I had to use to buy a new car. I am now on SSI and live on $1,400 a month and have to depend on Medicare and Medi-cal to pay my medical bills. I did write to her and tell her what had happened and received no response. ice years ago… remember Danny?